Four women hockey players from Odisha found place in the Indian Women’s hockey team for Rio Olympics which was declared today. It will be a debut for all four Odia girls in Olympics, sources said. 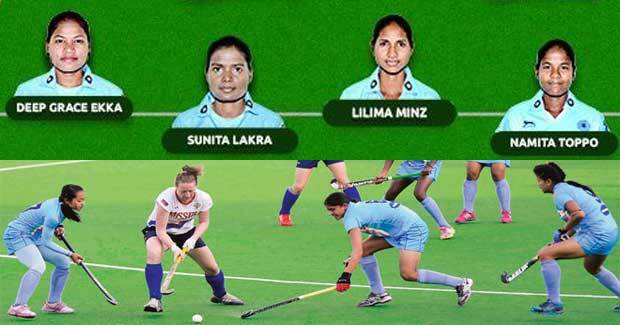 Deep Grace Ekka, Namita Toppo, Lilima Minz and Sunita Lakra are among the 16-member Indian Women’s Hockey team for Rio Olympics to be held in Rio de Janeiro from this August first week. Meanwhile, the Odisha Sports and Youth Services Minister Sudam Marandi announced Rs 50,000 incentives each for the four Odia players for finding a place in the National team for Rio Olympics. Odisha Chief Minister Naveen Patnaik also congratulated the four players from the state who found a place in the team. Notably, this is the first Olympic qualification for the women’s team in 36 years. At the Rio Olympics, the Indian women’s team have been placed in Group B alongside Argentina, Australia, Britain, Japan and United States. Women’s squad: Savita (GK), Navjot Kaur (midfielder), Deep Grace Ekka (defender), Namita Toppo (defender), Sunita Lakra (defender), Monika (midfielder), Anuradha Devi (forward), Poonam Rani (forward), Vandana Kataria (forward), Deepika (defender), Renuka Yadav (midfielder), Sushila Chanu (defender), Rani Rampal (forward), Preeti Dubey (forward), Lilima Minz (midfielder), Nikki Pradhan (forward).